City Packers & Movers is a premier service providing firm that deals with the Packing and Moving of Household or Office Items. We are a professionally managed company with a team of highly dedicated, specially trained, experienced and competent staff who religiously work for the satisfaction of customer’s needs. As a pioneer in the field of Packing and Moving, we shift and relocate goods to customer’s destination as required. We at City Packers & Movers have a huge warehouse for storage of household goods to ensure their protection. For further security and foolproof protection of the goods, we take utmost care to handle your belongings till it reaches safely at your doorstep. All fragile items are handled with utmost care. We have a team of supervisors as well as packers who manage the whole operations efficiently. At the same time we also ensure that all the transported goods and items reaches its target destination on a door-to-door basis with the best packaging material used by us. Moreover, we as a service organization also look after the unpacking and rearranging aspects of the whole operation to satisfy your needs and essentialities. We at City Packers & Movers also handle the sensitive assignment of electronic and software packaging, which is one of the special areas of our focus. Another thrust area of our set-up is localized relocation, Car Carrier transport & Warehousing. 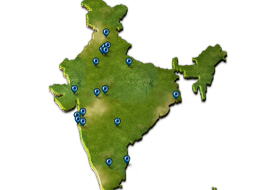 Our strength lies in our All India and International Network. We at City Packers & Movers offer full comprehensive door to door moving and relocation services with a Personal and Professional touch. All the elements of services rendered and or required are discussed in detail with our clients during our preliminary planning and thus ensure trouble free with punctuality, a comfortable relocation.